Ever wondered how the world’s super-rich fly? 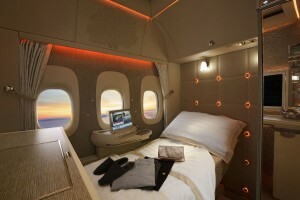 If Emirates’s new first class suites on its 777 are any indication, it might be even better than you could imagine. The first class suites feature a number of bells and whistles, most notably “zero-gravity” seats, virtual windows, and active noise cancelling E1 headphones from Bowers and Wilkins. Of course, mood lighting and an HD TV with thousands of channels are a given. Not to mention, the suites themselves are fully enclosed with a ton of room at 40 square feet. The zero-gravity seats were inspired by NASA and do their best to ensure optimal passenger comfort, alleviating potential aches and pains which accompany regular seats. With a total of six suites on the Emirate’s Boeing 777, the company’s creation appears to be living up to its “hotel in the sky” billing.